4. Students will examine an actual computer. 2. What happens if you get written up by the sub? 3. Rate the class for the following (1 = strongly disagree, 2 = disagree, 3 = neutral, 4 = Agree, 5 = Strongly agree) . Just write a number for each bullet point on how you feel your class did in each of these categories. Students respected the substitute, the classroom, and their peers. 4. 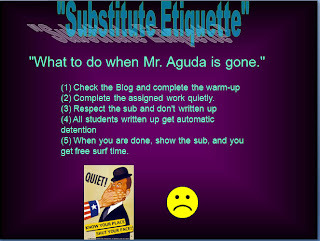 What can we as a class do better when Mr. Aguda is absent?